There is nothing like a mature and complex peated Malt on a chilly night in the cold time of the year… And I mean those fine old whiskies, not the pressure-cooked young ones we get swamped with these days. Mostly, the choice is coming down to an Islay-Malt or some rare Garioch, Brora or Talisker, and rightly so. Even one of those fine Japanese Single casks or an Ardmore would be nice. However, one beauty has unjustly been forgotten – maybe because bottles are rarely seen: Ledaig, especially the ones distilled in 1972. Only few other whiskies offer such complexity paired with heavy peat – and high ‘drinkability’. The quality of the barley malt used at Tobermory/Ledaig was comparable to Talisker and Brora (same source) in that year and has been delivering equally stunning results. In my eyes, good 1972 Ledaigs rank up as high as the finest Ardbegs of this period. I would trade some Islay Malts of the 1970’s any time for a nice Ledaig! Unfortunately, more recent Ledaigs fail to reach the level of quality the proprietors achieved between 1972 (reopening) and 1975. One can already see a decline after 1972. Only the 1972s possess this elegant maritime character of salt, spices, iodine, tar, a hint of sulphur, peat and smoke along with peach, gorse, vanilla, and numerous other aromas in perfect balance. Later in 1974, the peat levels were decreased which made briny fruits come forth in the whiskies of this time. Nowadays, the leading aromas of this are farmyardy and vegetal with more peat again since the 90’s. Having been a fan of this Mull Malt for quite a while now, I keep on trying expressions of 1972 and the years after. Bottles are hard to get, though. 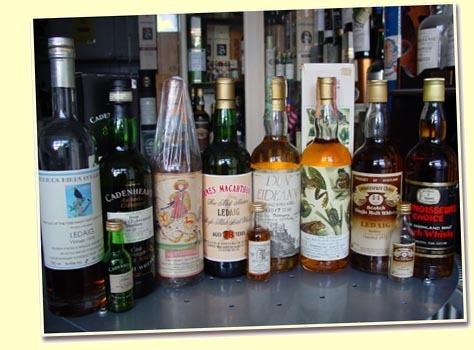 The photo shows some of my 1972 Ledaigs, and some of them are not yet sampled or opened (e.g. the Moon Animal series, the black labeled G&M, etc.). I will open them on suitable occasions. The following list shows my personal favourites which I have tasted until now – and is, of course, open for discussion.